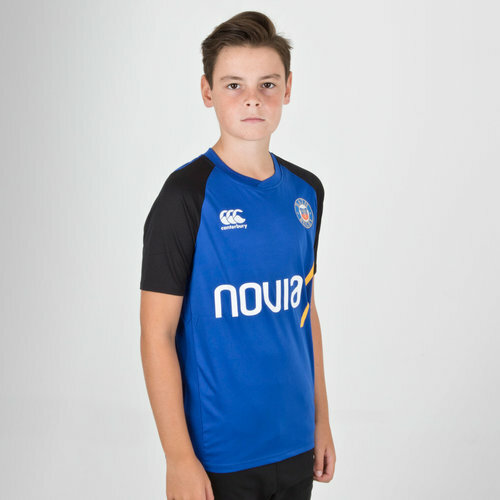 Keep it fresh and look your best whether in training, out and about or at the Recreation Ground in the Bath 18/19 Kids Superlight Training T-Shirt from Canterbury. Bath FC of the Gallagher Premiership have a fresh new training attire which looks like a winner feature Bath's classic three colours; black, blue and white. The lightest tee in the collection, the Bath VapoDri Superlight Graphic Tee combines performance and style. VapoDri technology keeps you cool and dry, while the quick drying fabric ensures a reduced wash-to-wear time. The low profile collar has been crafted to give a performance fit, ideal for the rugby physique, while the drop back hem eliminates distracting garment rise during your workout. This shirt comes predominantly in blue with black sleeves. The club badge and CCC logo are printed on the left and right as worn, respectively. The club's training sponsor - Novia - is printed across the middle. Look and train at your best in this Bath Kids Superlight Training T-Shirt.